View the digital edition of Engagement 101 Magazine – online now! The digital edition of Engagement 101 Magazine, a leading bridal publication, is online now for viewing. Readers can easily flip pages while reading about the latest jewelry companies, wedding dress designers, travel destinations and more. Engagement 101 Magazine is a leading resource for all things related to planning a modern wedding. View the latest issue of Engagement 101 Magazine. Shopping for jewelry from HIS point of view. “It’s a Man’s World,” a recent video from the bridal publication and online wedding portal Engagement 101, provides insights and tips about shopping for jewelry from the man’s point of view. This short video is full of advice for the guy that may be nervous or unsure with a jewelry, wedding band or engagement ring purchase. “It’s a Man’s World” has practical information that any man can use. The newest episode of Engagement 101 TV is all about men. The webisode delves into several manly topics, such as who should pick out the engagement ring (the guy or the girl), what guys like about women and what they do when they want to turn on a little romance. The video features several well-known jewelry designers, such as Rick Mulholland from Novell*, Mark Schneider from Mark Schneider Designs, Berge Abajian from Bergio and William Pung from Parade. Shant Hovsepian from Danhov gives a little advice for clueless guys going engagement ring shopping, while Abe Abaci from Gelin Abaci talks about how he knows what women want. The episode also includes several street interviews from average guys who talk candidly about love and making that daring step toward commitment. *Disclosure – Novell is an advertiser with Engagement 101. Wedding bands featured on Engagement101Mag.com. www.engagement101mag.com. The site will includes over a dozen assorted Novell wedding band styles which can be specially created in a variety of metals (platinum, palladium, gold), widths and finishes. Novell’s gallery demonstrates the wide range of designs that the company has to offer. The website re-launched December 15th, 2008. Please visit www.novelldesignstudio.com to find an authorized retailer in your area. Engagement 101 Magazine – a pull out supplement to Wedding Dresses Magazine since 1998 – became a newsstand title of its own in 2006. The first consumer publication ever to target the 2.4 million couples who are about to get engaged every year, Engagement 101 includes tips on how to propose, relationship advice, expert research, real life couples, buying guides, product options, party planning and nearly everything else needed for the organization of a wedding. 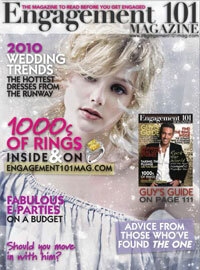 In 2009, the Engagement 101 print issue was completed by an interactive portal online – www.engagement101mag.com– and an original web-tv series – Engagement101 TV. Platinum rings featured on Engagement101Mag.com. 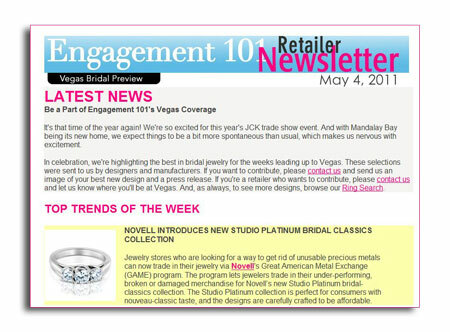 Engagement101Mag.com, the website for Wedding Dresses’ Engagement Ring 101 magazine, features platinum Novell wedding bands in its website header (which is seen with every page viewed), and in their gallery of wedding band designs. 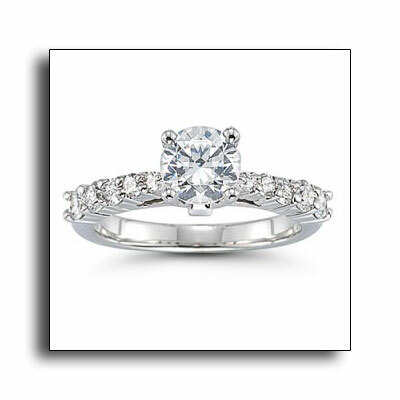 Platinum wedding bands featured on a leading bridal website. 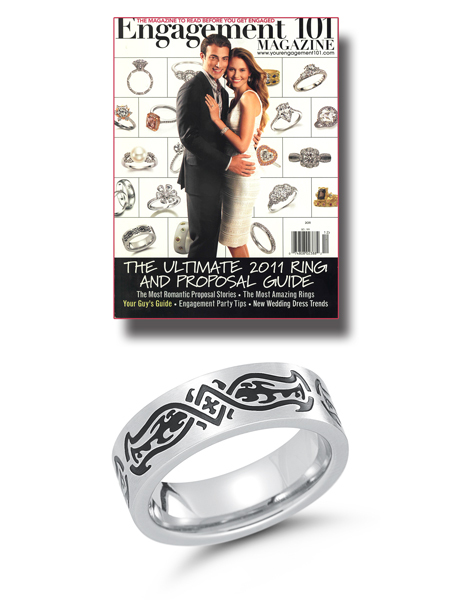 Novell profiled in Engagement 101 Magazine. The Engagement 101 issue of Wedding Dresses featured What You Deserve, an advertisement which positions the benefits of platinum separately to both women and men in a unique yet equal manner. Also included is a profile about the company which also highlights Novell customization capabilities, the importance of 950 platinum purity, Rose Veltri Jewelry, and customer satisfaction. Download the platinum wedding band ad and profile featured in Wedding Dresses. 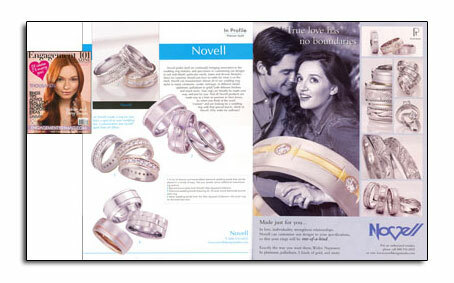 Novell wedding bands as featured in Engagement 101 Magazine. Platinum wedding bands in Engagement 101. The Engagement 101 issue of Wedding Dresses features Novell platinum wedding band styles E1784-4LC, P1785-4LC (10 x .02 round diamonds) and P1818-6GCC (8 x .04 round diamonds). 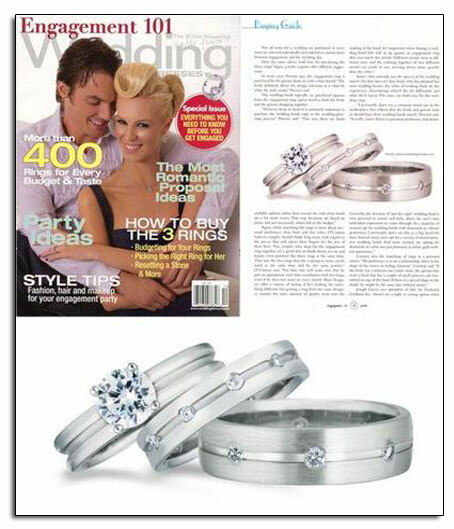 Download this editorial featuring platinum wedding bands. 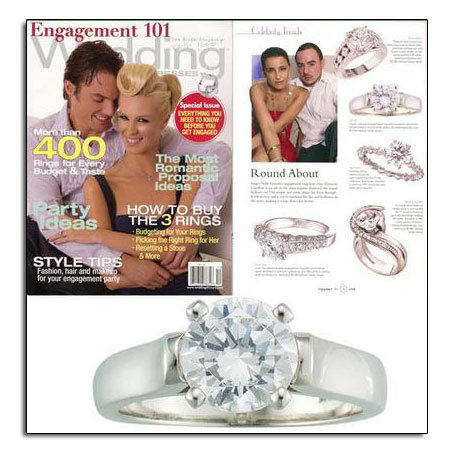 Platinum wedding bands in Engagement 101 bridal magazine.